I love to visit New Hampshire’s White Mountains in the summertime. It’s the perfect combination of closeness to Boston, tourist amenities, and nature to explore. To me, it’s better to stay at a bed and breakfast. There you get greeted warmly by your hosts and can learn about the region and get expert advice on where to go. It’s the right combination of comfort and staying as a guest with friends. Mountain roans meander, so you’ll want to stay somewhere central, such as The Bartlett Inn, centrally based in the White Mountains in Bartlett, New Hampshire. It’s pet friendly, non-smoking, and has an outdoor pool for the summer and outdoor hot tub for the winter. They are knowledgeable about local attractions, for example having discount tickets on hand. Or they’ll set up a murder mystery dinner train ride for you, or a couples’ massage. We stayed at the Pinkham Room, in a separate building on the second floor. It’s exceptionally clean with a dark wood floor, and the bathroom is clean and modern. It has a very comfortable king size bed where weary travelers can get needed rest, and has a side bed suitable for a child. In the room, you’ll find a microwave, fridge, and window air conditioner. A power strip would have been handy. Outside there’s a pool and playground. If there was a WiFi password, we didn’t see it, but got cell phone coverage well enough. Our stay was pleasant and completely quiet. We could easily have slept in if we’d needed to. Your stay comes with a midrange breakfast starting at 8:30am, a bit late if you’re on a schedule. The hosts were friendly. Help yourself to toast with jam, croissants, little muffins, whole milk, coffee, bananas, and orange juice. Diners get a choice of french toast or a breakfast tart. The strawberry cheesecake stuffed French Toast tasted more like a quiche than a toast and was too rich for us, but came with delicious fresh berries. The puff pastry breakfast tart had a runny egg, but the bacon and cheese weren’t overpowering, allowing one to taste the rich spinach and egg combination. 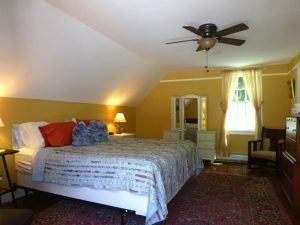 The Bartlett Inn is convenient, comfortable, friendly, and comes with amenities and guidance. I’m pleased to give it 4.5 stars.